After a decade of U.S. involvement in Afghanistan and Iraq, surveys by Pew Research have depicted an American public weary of foreign conflicts and wanting to turn attention to issues back home. Our poll last November found that half of Americans (52%) said the U.S. should mind its own business internationally and let other countries get along the best they can on their own, a view held by only 30% in 2002. But since then, there have been a host of new foreign crises that have further shaped public opinion about the threats facing the U.S. and what role the nation should play in the world. 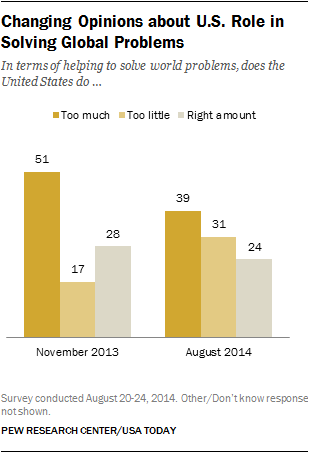 1 The American public is still wary about the U.S. getting too involved in military action. The public’s reluctance about U.S. engagement in foreign conflicts was evident in earlier surveys during the uprising against former Libyan leader Moammar Gadhafi in 2011 and the lack of support for U.S. intervention in the civil war in Syria in 2012. Our August survey found that the public backed President Obama’s decision to launch air strikes against the militant Islamic State of Iraq and Syria (ISIS) by a 54% to 31% margin, but the sense of caution about new U.S. involvement was still there. About half (51%) of Americans expressed concern that the U.S. would go too far in getting involved militarily in the conflict with ISIS. 2 While wary about U.S. global involvement, there has been a shift in Americans’ views since Russia’s challenge to the pro-Western government in Ukraine, and the rapid rise of ISIS in the conflict-ridden Middle East. Today, 39% of Americans say the U.S. is doing too much to solve world problems, a drop from the 51% who said the same last November. Those saying that the U.S. does too little to address global problems has nearly doubled, from 17% to 31%. 3ISIS is now on the American public’s radar as a top threat. Islamic extremist groups like al Qaeda have been at the top of the list for years in our surveys of what the public sees as major global threats to the U.S. About seven-in-ten (71%) Americans held that view in our latest poll, while 67% of Americans say that a major threat is ISIS, which a year ago was not even on the radar. The only other threats that have ranked as high as these two since 2009, at different points in time, have been North Korea’s nuclear program, Iran’s nuclear program, cyber attacks from other countries and the Taliban’s growing strength in Afghanistan. 4After months of confrontation with Russia over its actions in Ukraine, the share of Americans who view the Kremlin with concern has risen, but only modestly. About a quarter (26%) saw Russia as an adversary and another 49% as a serious problem, but not as an adversary, in a July survey. Those figures were little changed from our March poll, after Russia annexed Crimea. A survey in April again illustrated the public’s caution on involvement: 53% favored the use of increased economic and diplomatic sanctions against Russia, but 62% opposed sending arms or military supplies to the Ukrainian government. 5More than half (54%) of Americans now see Obama as not tough enough on foreign affairs and national security, according to our August poll. Far more Republicans (77%) hold that view than independents (56%) or Democrats (34%). Aside from its assessment of the president, the public thinks the U.S. wields less influence as a world leader than in the past. Nearly half (48%) of Americans say the U.S. is less important and powerful as a world leader than a decade ago, while 34% believe it remains as important.